The president has burned so many bridges, reversed so many positions and proved so unreliable a partner that he can no longer be sure of his own allies in the Senate. WASHINGTON — Senate Republican Leader Mitch McConnell uses a favorite Southernism when he explains why shutting down the federal government is bad politics. So when Trump — who won exactly nothing in his standoff with Democrats — threatened to shut the government again in coming weeks, he seemed to be hankering for the third kick of the mule. Forcing 800,000 federal workers and thousands of contractors to go without paychecks in the nation’s longest shutdown weakened Trump in several ways. The most obvious was his standing in opinion polls, which sagged during the five-week standoff. In an average of major surveys this week, only 42 percent of Americans said they approved of Trump’s job performance; 55 percent disapproved. Another sign of weakness was more subtle, but perhaps more important: his erosion of influence on Republicans in the Senate, where the GOP still holds a majority (unlike the House, which Democrats won in November). 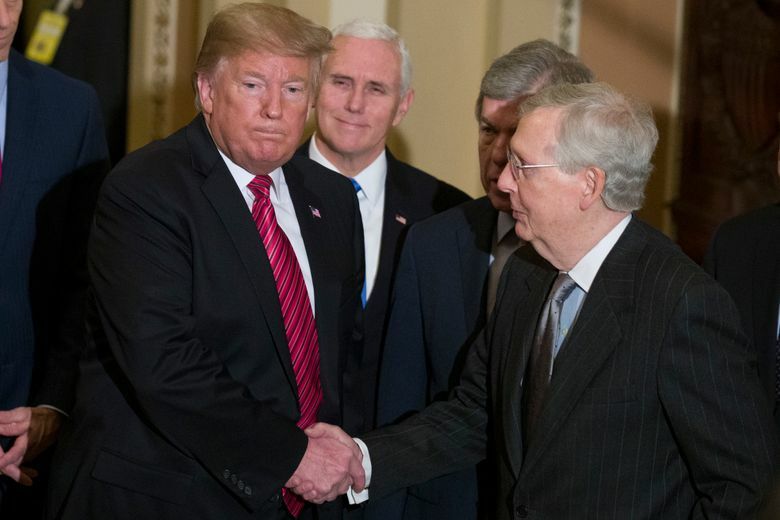 Trump backed down after McConnell warned the White House that he no longer commanded the votes to support the shutdown. McConnell reportedly reminded Vice President Mike Pence (again) of the diminishing value of mule kicks. The upshot: Trump has burned so many bridges, reversed so many positions and proved so unreliable a partner that he can no longer be sure of his own allies in the Senate. That’s a danger sign for a president who still hopes to keep the unfinished promises of his 2016 campaign — a border wall, an infrastructure program, lower drug prices, new trade deals — as he seeks reelection in 2020. “Presidential power is the power to persuade,” political scientist Richard E. Neustadt wrote in a classic 1960 study of the presidency. By “persuade,” Neustadt meant a president must convince other politicians that their own interests lie in helping him, and that if they stand in his way, they’ll regret it. That takes considerable political skill. Matt Glassman, an expert on Congress at Georgetown University, argues that Trump failed the Neustadt test in the latest shutdown by picking a fight he could not win. The episode offers several lessons on how Trump’s next two years may look. First, Senate Republicans will continue aligning themselves publicly with the president, who remains popular among GOP voters, and will continue supporting him on issues they like — confirming conservative federal judges, for example. But they will be more hesitant to back Trump proposals that aren’t part of a traditional Republican agenda: a border wall, an expensive infrastructure program, legislation to force drug companies to lower prices. Second, Trump has a much bigger problem than wavering enthusiasm in the Senate. He has hit a wall in the Democratic-led House. House Speaker Nancy Pelosi kept her troops firmly in line during the shutdown despite White House attempts to find centrist Democrats who might bolt. Trump’s failure made the speaker stronger for legislative fights ahead. “He may think (infrastructure spending and other proposals) have bipartisan appeal, but I don’t think he perceives how tough it will be to get anything passed,” Glassman told me. If Trump repeats his campaign promises in the State of the Union speech on Feb. 5, it won’t mean much. None are likely to pass. Finally, the 2020 campaign is already gathering steam — and even if Trump’s chances of passing legislation are small, he’ll want to appear presidential. Glassman argues that Trump could gain ground by forcing Democrats to take risky and unpopular votes. He expects a White House push to make the 2018 tax cuts for high-income earners permanent, for example. “It’s an issue that unifies Republicans and causes trouble for centrist Democrats,” he said. But if Trump wants to appeal to the independent and centrist voters who backed him in 2016 because they wanted an end to gridlock in Washington and liked his populist promises, he’s in trouble. That’s thanks, in part, to his government shutdown — and his failure to heed all those warnings about the kicks of a mule.